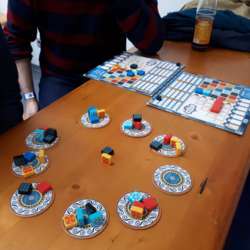 You must be a member of the Munich Card and Board Games Group to attend this activity. Would you like to join this group? Another games evening! Anyone can bring a game and we can play whatever people are feeling that night. We play mostly in German, so please come if you are a native speaker or if you have a good command of German. Playing is a great opportunity to practice your German skills! You don't have to know or bring specific games to come though. Jeder kann jedes Spiel mitbringen, gespielt wird je nach Laune. Oft werden Siedler, Saboteur, Jungle Speed, Monopoly Deal, Kuhhandel oder Tarot gespielt. Wir spielen die meiste Zeit auf Deutsch.